VIII. Various Types of Closed Covering Walks. Double Tracings. Value-True Walks and Integer Flows in Graphs. The Chinese Postman Problem. The Chinese Postman Problem for Graphs. Some Applications and Generalizations of the CPP. Applications. t-Joins, t-Cuts and Multicommodity Flows. Hamiltonian Walks, the Traveling Salesman and Their Relation to the Chinese Postman. The Directed Postman Problem. The Mixed Postman Problem. The Windy Postman Problem and Final Remarks. Exercises. IX. Eulerian Trails - How Many? ...As Many As...-Parity Results for Digraphs and Mixed Graphs. An Application to Matrix Algebra. The Number is ...- A First Excursion Into Enumeration. The Matrix Tree Theorems. 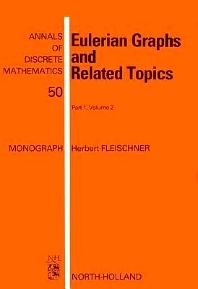 Enumeration of Eulerian Trails in Digraphs and Graphs. On the Number of Eulerian Orientations. Some Applications and Generalizations of the BEST-Theorem. Final Remarks. Exercises. X. Algorithms for Eulerian Trails and Cycle Decompositions, Maze Search Algorithms. Algorithms for Eulerian Trails. Algorithms for Cycle Decompositions. Mazes. Exercises. Bibliography. Index. Appendix: Corrections and Addenda to Volume 1.